For the moment there is no network version, the license type is single license for each computer. The same is true for ProfLT application. How do I load the program? 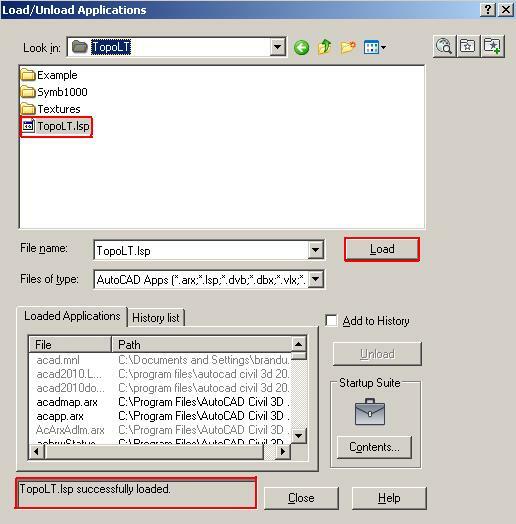 Open your CAD application and type the APPLOAD command (or a similar command depending on the CAD application you are using). When the Load/Unload Application window opens, select the TopoLT.lsp file (by default you can find it in C:\Program Files\TopoLT) and press the Load button. After the program loads you should receive the message “TopoLT.lsp successfully loaded”. Press the Close button. Which are the limitations of the trial version? The trial version can be used without limitations for 30 days from installation. After the trial period expires, in order to continue to use the TopoLT program, you must buy a license. How can I learn to use TopoLT? TopoLT is provided with a set of exercise files for practice and with the program help file where every command is presented and explained. Based on these exercises we developed written and video tutorials which explain the most important features of the application. Please download the tutorials and exercises from User Manuals page of the Download menu. Where can I download the trial version? You can download the trial version of TopoLT from the Downloads page. To acces the downloads you are required to log in or create an account. How can I register the program? After you bought the license you can register it using the Software Registration function. In the registration window write the user name, company name and registration code from your license certificate and press Register. Does the program run on 64-bit systems? Yes, please see the system requirements. How can I receive technical support in case I need it? In order to receive technical support you must complete the technical support request form from the Support page. 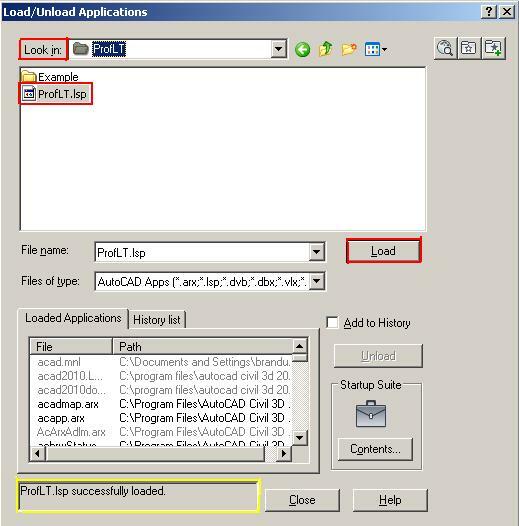 Open your CAD application and type the APPLOAD command (or a similar command depending on the CAD application you are using). When the Load/Unload Application window opens, select the ProfLT.lsp file (by default you can find it in C:\Program Files\ProfLT) and press the Load button. After the program loads you should receive the message “ProfLT.lsp successfully loaded”. Press the Close button. The trial version can be used without limitations for 30 days from installation. After the trial period expires, in order to continue to use the ProfLT program, you must buy a license. How can I learn to use ProfLT? ProfLT is provided with a set of exercise files for practice and with the program help file where every command is presented and explained. Based on these exercises we developed written and video tutorials which explain the most important features of the application. Please download the tutorials and exercises from User Manuals page from Download menu. You can download the trial version of ProfLT from the Downloads page. To acces the downloads you are required to log in or create an account. After you bought the license you can register it using the Register Application function. In the registration window write the user name, company name and registration code from your license certificate and press Register. In order to receive technical support you must complete the technical support request form from the Support menu. 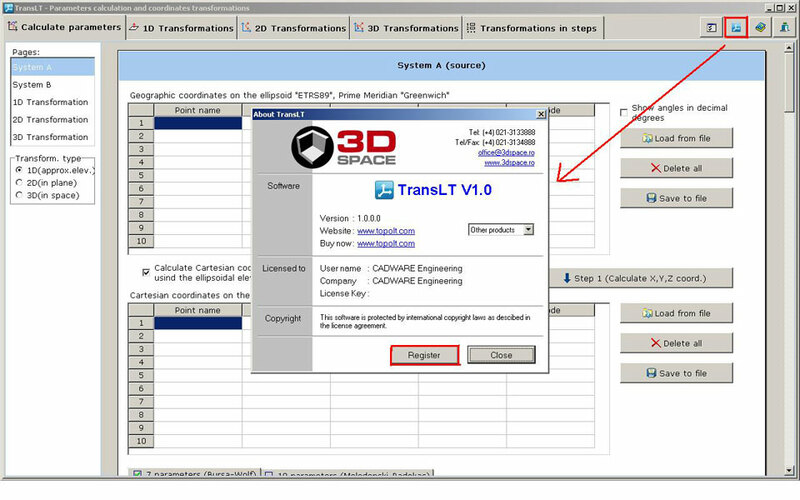 After you bought the license you can register it using the About TransLT function. In the registration window write the user name, company name and registration code from your license certificate and press Register. There you have to complete your name, email, and in the Message field please describe as detailed as possible the problem you encountered. We may contact you for additional information if necessary (screenshots, drawing file). What is the EPSG database? define a coordinate reference system (CRS) which ensures that coordinates describe position unambiguously. define transformations and conversions that allow coordinates to be changed from one CRS to another CRS. Supplementary information about the signification of the terms and the organization mode of the EPSG database can be found in the Guidance Note Number 7, part 1: Using the EPSG Geodetic Parameter Dataset published by OGP and available for download and viewing at the address www.epsg.org. From the 6.1 version (july 2001) for the EPSG database has been adopted a new strategy according to which the recordings that contain errors will never be deleted. It has been put into practice by introducing an indicator (deprecated indicator) that can take the values true or false (yes or no) as the respective recording contains or not significant errors. All interrogations made by the TransLTin the EPSG database use a filter that eliminates the recording that have the deprecated field set as yes. What types of map projections does TransLT support? What types of transformation does TransLT support? What types of GRID files does TransLT support? What offset methods does TransLT support?